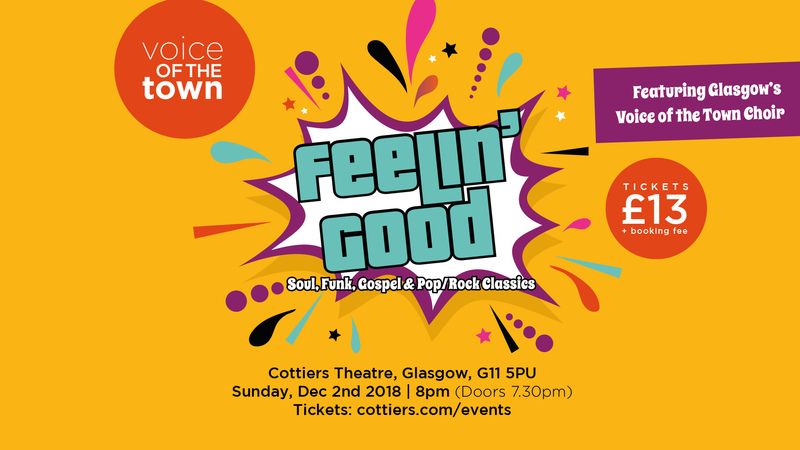 Following last year’s brilliant show, Soul Struttin’, Glasgow’s Voice of the Town Choir is back at the stunning Cottiers Theatre with an even bigger and funkier show than ever before! Featuring fantastic songs from Gospel, Soul/Funk, RnB and Pop/Rock with stunning, powerful harmonies, original and exciting vocal arrangements and foot- stomping funky grooves, all performed by one of Glasgow’s finest contemporary music choirs, it promises to be a must-see show. And, with some of the region’s very best musicians accompanying live, and a hugely talent support act to kick the show off, a top evening of soulful, compelling music awaits.